Get Up to $3,500 in UAD plug-ins from Studer, Lexicon, AKG, Pultec, Fairchild and more! For a limited time, buy any award-winning Apollo rackmount audio interface and get an analog dream studio filled with up to $3500 of genuine UAD plug-ins from Studer, Lexicon, AKG, Pultec, Fairchild, Teletronix, and more! That’s right — now through August 31st — there’s never been a better time to upgrade to Apollo, the world’s most acclaimed professional recording interfaces for Thunderbolt- and Firewire-based Mac and Windows studios. Apollo boasts industry-leading A/D and D/A conversion. And with its onboard DSP processing, you can track through authentic UAD analog emulation plug-ins with near-zero latency -- regardless of your audio software’s buffer size, and without taxing your host computer’s CPU. It’s like having all the processors of a dream vintage analog studio, right in your rack. No coupons or redemption codes are necessary. The promotional plug-ins will be automatically added to your account once you register your new Apollo 8, 8p, 16 or Apollo FireWire unit. Already own any of the promotional plug-ins? No problem. Purchase and register a new Apollo rackmount interface and you’ll be able to pick from a group of alternate plug-in(s)* on the UA website. Apollo Dream Studio ends August 31st, 2017. 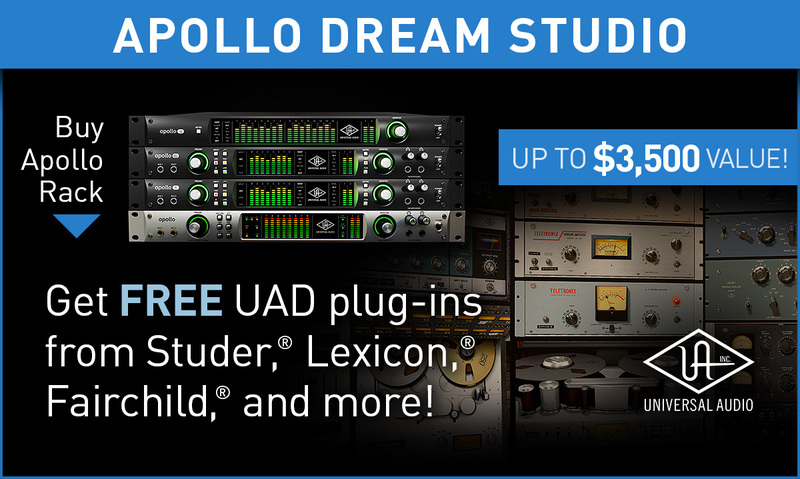 Shop Apollo now to get your free plug-ins! More than $1200 / €1200 / £900 Value! More than $2,000 / €2,000 / £1500 Value! More than $3500 / €3500 / £2600 Value! This promotion is valid for any new Apollo rackmount audio interface (Apollo 8 DUO/QUAD, Apollo 8p, Apollo 16, Apollo FireWire) purchased from an authorized UA dealer between April 1st and August 31st, 2017. All promotional fulfillment, including alternate plug-ins, are subject to approval by Universal Audio.